Q: According to reports, the US Senate Committee on Foreign Relations advanced the Taiwan Travel Act the other day, after US House of Representatives passed the bill. The bill encourages the US government to lift restrictions on high-level exchanges between the US and Taiwan. What is your comment? A: The relevant provisions in the Act, though not legally binding, still gravely violate the one-China principle and the three China-US joint communiqués. If becoming law, it would severely disrupt China-US and the cross-Straits relations. China is strongly dissatisfied with and firmly opposed to that, and has lodged stern representations with the US. The one-China principle is the political basis for China-US relations. 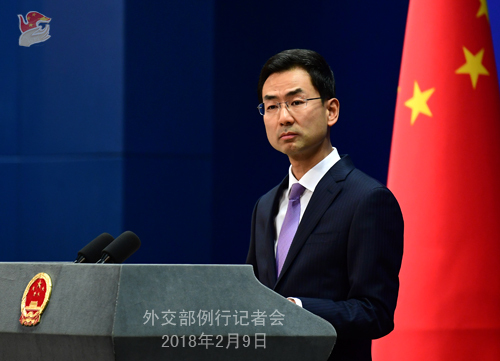 We urge the US to honor its pledges made to China on the Taiwan issue, stop advancing the bill, properly deal with Taiwan-related issues, and ensure steady development of China-US and the cross-Straits relations. Q: According to reports, US forces in Afghanistan yesterday carried out an airstrike against the bases of East Turkestan Islamic Movement(ETIM). Does China share intelligence with the United States on this and is China pleased to see the United States is taking the threat from the ETIM seriously? A: I don't have specific information with regard to this at hand for now. Terrorism is the common enemy of mankind and fighting terrorism is the shared responsibility of all countries in the world. Over the past few years, the ETIM, among other East Turkestan violent terrorist forces, has orchestrated and implemented a series of terrorist attacks inside and outside China, which also posed serious threats to relevant countries in the Middle East and Central Asia. Fighting the East Turkestan terrorist forces represented by the ETIM is not only China's core concern regarding counterterrorism, but also an important part of the international fight against terrorism. China always upholds the anti-terrorism concept of taking a multi-pronged and holistic approach to address both the symptoms and root causes. We stand ready to continue strengthening pragmatic cooperation in fighting terrorism with all other parties based on the principle of mutual respect, equality and mutual benefit so as to jointly maintain international and regional peace and stability. Q: After the earthquake in Hualien, Taiwan, some Japanese senior officials conveyed their condolences while addressing Taiwan politicians in their so-called "official" titles. What is your comment? Have you lodged representations with the Japaneseside? A: After the strong earthquake rocked Hualien, Taiwan, every heart on the mainland is throbbing with the suffering of Hualien. Zhang Zhijun, Director of the Taiwan Affairs Office of the State Council has already sent condolences to our compatriots in the affected areas in Hualien, and offered to send rescue teams and provide all necessary assistance. I must stress that Japan's "one China, one Taiwan" attempt under the cloak of disaster relief violated the one-China principle and went against its commitments on Taiwan-related issues. China is strongly dissatisfied with that and has lodged stern representations with the Japanese side. 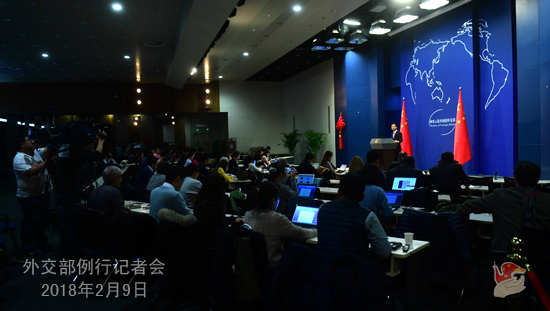 We urge the Japanese side to faithfully abide by the principles of the four political documents between China and Japan and immediately correct its wrongdoings so as to avoid any new disturbance to China-Japan relations. Q: The Philippine media still has not taken their eyes off the South China Sea. Could you tell us when the second meeting of the China-Philippines Bilateral Consultation Mechanism (BCM) on the South China Sea will be held? A: The China-Philippines BCM on the South China Sea was set up and has been running smoothly as agreed by and under the support of the two leaders. The first BCM meeting, which was held in Guiyang, China on May 2017, yielded fruitful outcomes. The two sides have been in effective communication with each other on properly dealing with relevant maritime issues and promoting practical maritime cooperation. China and the Philippines are seeking to hold the second BCM meeting in the near future. 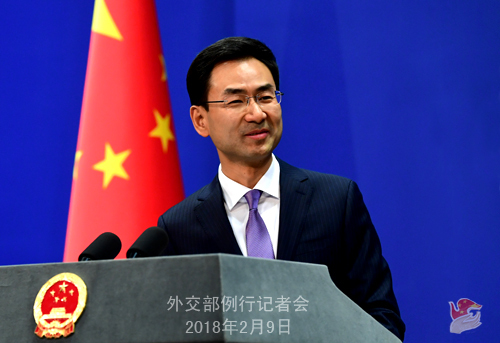 China looks forward to deepening communication and cooperation with the Philippine side on the relevant issues by ensuring a success of the second meeting, thus creating a sound environment for the sound and steady development of China-Philippine relations and all-around practical cooperation. As far as I know, the two sides are in close communication with each other on the specific arrangements for the second BCM meeting. Q: First, the Maldives' Special Envoy is here holding talks with the Chinese officials. Perhaps you can tell us what exactly is the request from the Maldives and what kind of support is China going to extend to them? Second, the Maldives' situation figured very prominently in the telephone talks between President Trump and Prime Minister Modi today where they expressed concerns and wanted the Maldives' government to implement the rule of law in the Maldives. Also, the UN Security Council has met and the UN Assistant Secretary General has warned the UN Security Council ahead of the meeting that the situation in the Maldives could deteriorate further if no action is taken by the international community. What is your reaction? A: With regard to your first question, on February 8, Foreign Minister Wang Yi met with President Yameen's Special Envoy, the Maldivian Minister of Economic Development Mohamed Saeed. Minister Saeed briefed on the current situation in the Maldives and said that the Maldivian government is committed to upholding the rule of law and order, independently resolving the issues facing that country and realizing national stability and development. The Maldives has the capability to protect the security of Chinese personnel and institutions in the Maldives with all-out efforts. Foreign Minister Wang Yi said that China has been following the development of the situation in the Maldives and believes that the Maldivian government and people have the wisdom and capability to properly handle the current problem and resume the normal national order in accordance with the law. China will not interfere in the internal affairs of the Maldives, and this is also a basic norm governing the international relations enshrined in the UN Charter. We support the Maldivian government in resolving differences with relevant parties in the Maldives through dialogue and negotiation and upholding the independence, sovereignty and legitimate rights and interests of the nation. The international community should play a constructive role in promoting stability and development of that country on the basis of respecting its will. China has provided selfless assistance to the socio-economic development of the Maldives, and the China-Maldives cooperation has delivered benefits to all the Maldivian people. We hope the China-Maldives comprehensive friendly cooperative partnership will keep developing in a sound and steady manner. Before the meeting, Vice Foreign Minister Kong Xuanyou held a talk with Minister Saeed. On your second question, what happens now in the Maldives falls within that country's internal affairs and should be properly resolved by various parties in the Maldives through dialogue and negotiation. The international community should play a constructive role on the basis of respecting the Maldives' sovereignty and will rather than take actions that may complicate the situation. Q: Reports say that according to Indian military sources, India has placed its military on high alert, and the country's special forces units are on standby to help restore order in and evacuate Indians from the Maldives. What's your comment on that? A: As I just said, what happens now in the Maldives falls within that country's internal affairs. Non-interference in one's internal affairs is a basic norm governing the international relations enshrined in the UN Charter. The international community should play a constructive role in promoting stability and development of the Maldives on the basis of respecting its sovereignty and will instead of doing the opposite. Q: In his talks with Foreign Minister Wang Yi, did the Maldives' Special Envoy explained how are they going to resolve the situation specifically when they say they would like to do it internally? A: Like what I said just now, Minister Saeed said that the Maldivian government commits itself to upholding the rule of law and order, independently resolving the issues facing the country and achieving national stability and development. Q: What did you mean by independently resolving the issues? Does that mean unilaterally resolving? Because the problem will be unilaterally solved as the opposition leaders and the Supreme Court judges are behind the bars. Does China have any response to that? A: You'd better ask the Maldivian government for how they will resolve their internal affairs. I would like to stress hereby that China believes that the Maldivian government and people have the wisdom and capability to properly handle the current problem. Follow-up: Did the Special Envoy indicate that they would like to seek China's help to resolve the issue or want China's mediation in the matter? A: The diplomatic channel between China and the Maldives remains unimpeded and the two sides maintain normal friendly exchanges.